Like actors, athletes are photographed all the time. Not every photo is gold though. Some are just plain embarassing and stupid. Maybe it’s drugs, maybe it sounded like a good idea at the time. 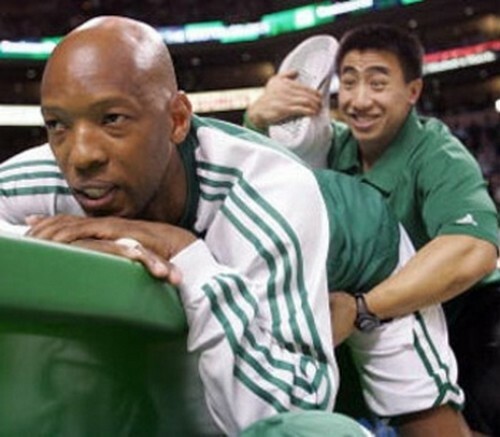 These are some of the most embarassing photos of athletes. Lebron James dressed as Bobby Brown. At first I said to myself “ok this must have been for Halloween.” Nope, this was during the 2007 ESPYs and an attempt to gain more votes for MVP. What year did he think it was? Maybe this would have been cool if it was the early 1990’s and your were trying to pertray someone a little less stupid. A drugged out Oscar De La Hoya in drag. DeSean Jackson dives onto the one yard line for no reason. Jackson plays for the Philadelphia Eagles now, but in 2005 while playing in the Army All American Bowl, Jackson decided to dive into the end-zone to score a touchdown. The only problem is, he actually touched to ball down to the ground just outside of the end zone. The most embarrasing thing about it was, nobody was around him! It doesn’t matter that this is a professional photo for a magazine. I think this photo portrays a pretty accurate image of how we think A-roid sees himself. Afterall, this is a guy who is rumored to have a painting of himself as a Minotaur hanging up in one of his homes. Sometimes elders need to teach kids a lesson. That’s what happend back in 93. Ryan hit Ventura in the back as a result we have this classic photo of a 46 year old beating the hell out of a 25 year old.